The government is launching a "comprehensive audit" of European Union powers and their impact on the UK. In a Commons statement, Foreign Secretary William Hague outlined plans to scrutinise every aspect of EU law. The audit is a "necessary and positive part of reforming Europe", he said, and is due to conclude in 2014. Labour said that an urgent strategy was needed sooner than 2014 to inform the UK's response to greater political integration in the EU. Shadow foreign secretary Douglas Alexander also sought to highlight divisions in the coalition over the subject, pointing out that former Lib Dem leader Charles Kennedy was the only backbencher from his party to have listened to the statement in person. Mr Alexander said Labour had "no objection to a proper, thorough and factual analysis of what the EU does and how it affects us in the UK". But Mr Hague's statement had seemed "contextless and rather ahistorical", he said. Since detailed proposals for greater economic union would be up for discussion at an EU summit due in December 2012, the audit would be too late to "inform the government's negotiating position" with EU leaders on the subject. "The truth is that Britain urgently needs an effective Europe strategy, and an audit, while worthwhile, is not a substitute for a strategy," he said. But Mr Hague said the audit would constitute "the most thorough and detailed analysis possible on the extent of EU powers", and would provide valuable evidence for policy-makers in the future. "Government departments will be tasked with consulting and inviting evidence from everyone with a knowledge of, and interest in, the exercise of the EU's competences," he explained, "including, of course, committees of Parliament and the devolved administrations, but also businesses, civil society, other interested parties and individuals with expertise in and experience of each area. "We will be equally interested to hear from car manufacturers about EU product standards as from NGOs about environmental policies, or security experts about combating organised crime." 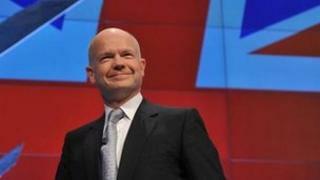 Mr Hague denied that it was a consultation about disengaging or withdrawing from the EU. "We must take the opportunities for Britain to shape its relationship with Europe in ways that advance our national interest in free trade, open markets and co-operation," he told MPs. "That should involve less cost, less bureaucracy and less meddling in the issues that belong to nation states." In response, Charles Kennedy said the review would help inform people about the coalition's "positive agenda for Europe" by providing a "constructive and serious British-led contribution to the wider European debate about how to modernise, reform and improve the EU". He warned those calling for extensive repatriation of powers not to "hold the EU to ransom". But Conservative MP and chairman of the Commons European scrutiny committee Bill Cash urged the foreign secretary to ensure that the audit focused on "the necessity for a referendum as soon as it can possibly take place". Tory MPs John Baron and James Clappison added their support for a referendum, and their Conservative colleague Philip Hollobone demanded that the audit consider whether the UK was better off in or out of the EU altogether. "It will be a wide-ranging review," Mr Hague said, but he added: "It is not a review about a referendum." The coalition agreement included a pledge to hold such a review, focusing on EU rules on working hours. "We will examine the balance of the EU's existing competences and will, in particular, work to limit the application of the Working Time Directive in the United Kingdom," the agreement said. Conservatives have long pressed for Britain to be exempted from the European Working Time Directive and other laws they see as harming Britain's economic competitiveness. But Liberal Democrat leader Nick Clegg reportedly wants the review to be undertaken in a low-key manner to avoid souring relations with other EU member states. The foreign secretary told the BBC in October that "excessive regulation" and "unnecessary interference into daily life" from EU institutions had contributed to a British sense of disillusionment over Europe. But although he was in favour of repatriating powers from the European Union, he conceded that there was "no immediate prospect" of rebalancing power between the UK and the EU, he told the Andrew Marr Show. Earlier this month, he returned to the programme to explain that the government wanted the opportunity to negotiate a "better relationship" between the UK and Brussels, which would include the return of some powers, before asking the British people to vote on the changes. There would be a "very powerful" case for an EU referendum if member states agree a closer union, he added. The audit is to be co-ordinated by the Foreign Office and the Cabinet Office and will invite written evidence from British businesses and EU institutions. Ukip peer Lord Pearson of Rannoch has long campaigned for an inquiry into the "economic costs and benefits arising from our membership of the EU". "For more than 30 years, our political class has done its best not to talk about our membership of the EU," he told the House of Lords in November. But the audit is reportedly not going to include a cost-benefit analysis, owing to the difficulty of quantifying such aspects of EU membership as foreign affairs influence.